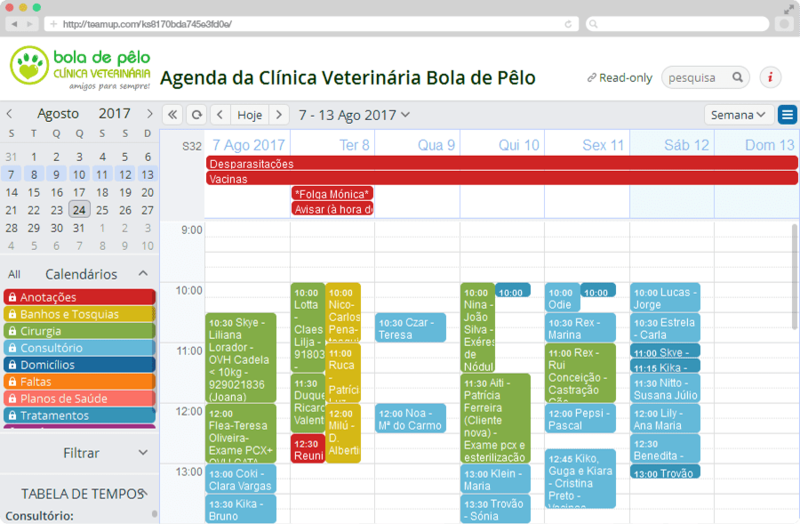 This case study is written by Pedro Ramalho, person responsible for the management, development and facilities of the Bola de Pêlo – Veterinary Clinic. Licensed by the Superior Technical Institute of the Technical University of Lisbon, he also develops in parallel with the management of the Clinic equipment for veterinary medicine. Bola de Pêlo is a Veterinary Clinic located in the town of Varge Mondar (Albarraque), in the convergence of the Municipalities of Sintra, Cascais and Oeiras. This project was carried out in 2008, initially starting with a very simple structure based only on the figure of Clinical Director Joana Brito, veterinarian since 2000. This fact has provided a close and familiar involvement with their Clients. They perfectly know their patients and their owners. They also believe that this is the basis and starting point for a solid and lasting relationship, generating mutual respect and trust. We were in need of a appointment book to manage all our different kind of appointments, for our team. Before we used to do it by hand in a notebook and as we were having more and more appointments it was getting difficult to manage well. Teamup was our first attempt for changing to an online appointment book. It fullfilled so well our needs from the very first moment that we didn’t searched any other solution. Today, more than a year since then, our team cannot live without the Teamup calendar. Note by Teamup – Thank you Pedro for sharing this great use case. We appreciate the opportunity to be of service to a veterinary clinic and look forward to contributing more to the efficiency in helping both people and their pets!